One of the problem when repairing printer is you accidentally deleted the EEPROM on the printer. If deleted the eeprom possibility the will not work normally. What is EEPROM? EEPROM is short from “Electrically Erasable Programmable Read-Only Memory” and it be used to store small amounts of data that must be loaded when the device is on. The data usually contain configuration for the device. The device that using EPPROM such as printer, camera digital, computer and other. 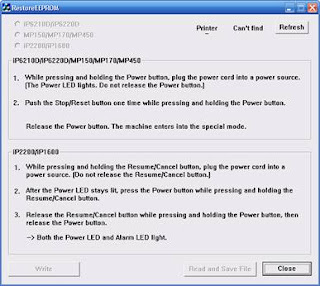 This software can be used to restore EEPROM on the Canon Printer types iP2200, iP1600, iP6210D, iP6220D, MP150, MP170, and MP450. Here the screenshot of the software. 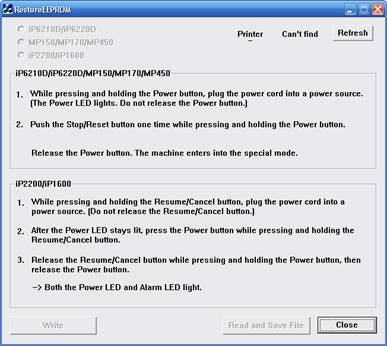 0 Response to "Software Resto eeprom print Canon iP2200, iP1600, iP6210D, iP6220D, MP150, MP170, and MP450"